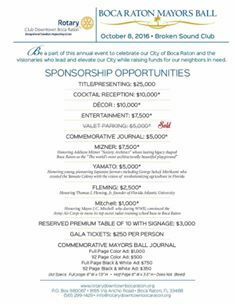 2018 Boca Raton Mayor's Ball - 2018 Mayor's Ball is not scheduled yet but consider the 20th Annual Honor Your Doctor Luncheon on March 28th 2018 at Boca West Country Club. Tickets are available on the Downtown Rotary Website. Boca Raton based health and wellness non-profits will benefit from the grants provided through the 2018 Mayor's Ball event. Event Co-Chairs this year are: Jon Kaye & Constance Scott. Emeritus - Karl Oeltjen, Honorary Chair Bill T. Smith. 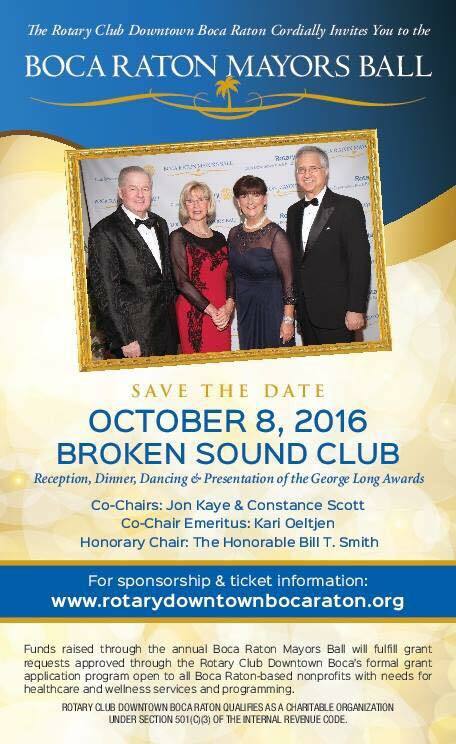 The event is slated to be held at the Broken Sound Country Club event room. Tickets start at $250. cocktail reception $10,000 and presenting sponsor is still available for $25,000. More details will be added as the event comes closer to fruition.